The Public Utility Commission of Texas called Thursday for reforms in the Electric Reliability Council of Texas to enhance market efficiency while implementing a scarcity price adder more frequently, but rejected another market reform stakeholders suggested. Phasing in an increase in the loss-of-load probability used in calculating the ERCOT’s Operating Reserve Demand Curve, with an increase in the standard deviation by 0.25 this year and another 0.25 increase in 2020. Implementing real-time co-optimization of energy and ancillary services. Rejecting the inclusion of marginal line losses in calculations ERCOT uses to dispatch generation across the system. During Thursday’s meeting, Commissioner Arthur D’Andrea said he fully supported all of Walker’s positions, while Commissioner Shelly Botkin said she favored the ORDC change’s first phase implementation this year, but hesitated to support a second phase. Stakeholders offered differing reactions, with some disagreeing with the ORDC proposal and others supporting the proposal to include marginal line losses in energy dispatch. “We believe this is the right decision for the long-term success of the competitive electric market and for consumers in Texas,” said Curt Morgan, Vistra Energy president and CEO. Calpine spokesman Brett Kerr also praised the PUC’s “deliberative and thoughtful” decisions. “We applaud the PUC for taking action today on market pricing reforms,” Kerr said. “True market price signals, reflecting the current need for additional capacity and energy, should incent reliable operation of existing units and new generation. The ORDC change would, in effect, cause the price adder to be used more frequently and at a higher level. 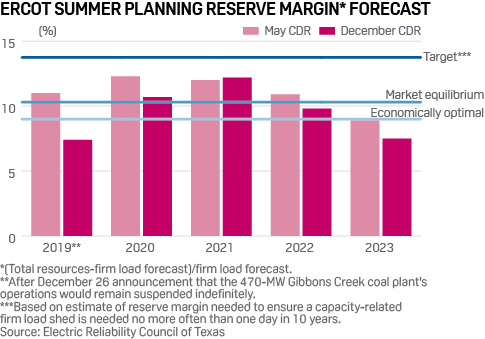 Warren Lasher, senior director of system planning, acknowledged Thursday that the December 26 announcement that the 470-MW Gibbons Creek coal plant would be mothballed indefinitely reduces the forecast planning reserve margin for summer 2019 to 7.4%, down from 8.1% included in the ERCOT Capacity, Demand and Reserves report issued December 4 — already the lowest level for a prompt-year summer reserve margin since at least 2000. Dan Woodfin, ERCOT senior director of system operations, said Thursday ERCOT would likely have to deploy certain emergency procedures, such as voltage reductions and the Emergency Response Service, which relies heavily on demand response. “There’s no indication at this point in time that we will have to implement rotating outages, but at that reserve margin level, there’s a likelihood that rotating outages may be needed,” Woodfin said. Kenan Ogelman, ERCOT’s vice president for commercial operations, said Thursday that ERCOT could implement the ORDC change’s first phase about four weeks after ERCOT’s February 12 board meeting, which could put it in effect by April. Implementing real-time co-optimization of energy and ancillary services is considered a more expensive, long-term fix that would enhance market efficiency. Currently, ERCOT procures ancillary services in the day-ahead market to ensure grid reliability in real time, but those services may become infeasible because of congestion or suppliers’ failure to meet commitments, which would require a supplemental ancillary services market process, entailing time, money and the risk of shortages. With real-time co-optimization, ERCOT could use its “security-constrained economic dispatch” computer system, to “dynamically assign AS responsibilities” throughout the day and replace infeasible AS, an ERCOT study issued in July stated. RTC would also improve ERCOT’s ability to manage its growing intermittent resource fleet, which would “result in more efficient and nimble unit commitments by market participants,” the ERCOT study said. Marginal line loss is the electricity dissipated as power is transported over long distances, and that electricity’s cost is currently socialized to the market, which means that resources farthest from load may get paid the same as if they were adjacent to load. The current system incorporates and assigns congestion costs, but not marginal line losses. The marginal line loss proposal would reward resources closer to load — typically conventional generation — and discourage the deployment of resources further away from load — typically West Texas wind resources. “Although assigning marginal transmission losses is common in other markets and an efficient way to account for losses, I do not believe that the incremental benefit of applying marginal losses in the ERCOT market is worth the implementation cost and market disruption,” Walker said in her pre-meeting memo. The Sierra Club’s Reed said his group was “very pleased” by the PUC’s decision to reject the marginal line loss proposal, but Bill Peacock, Texas Public Policy Foundation vice president for research, said the marginal line loss proposal was the only one designed to strike at the key issue — renewable energy subsidies — that causes ERCOT supply tightness. “By refusing to look at marginal line losses, it just exacerbates the problem,” he said. Gurcan Gulen, former senior energy economist at the University of Texas Bureau of Economic Geology’s Center for Energy Economics, also favored the marginal line loss proposal. “These are all needed improvements to scarcity pricing, especially in an energy-only market,” Gulen said. ERCOT’s July market pricing reform study showed that incorporating marginal line losses in energy dispatch would have created net benefits in cases of medium and low natural gas prices, but costs would have outweighed benefits with high gas prices.